Last week while I was a Panera Bread they were handing out smoothie samples, so I tried their Black Cherry Smoothie. Oh boy I thought, why haven’t I made a cherry smoothie before? You know me, once I get an idea in my head I can’t stop myself until I just do it! So guess what? I did it!!! Oh baby, did I do it! 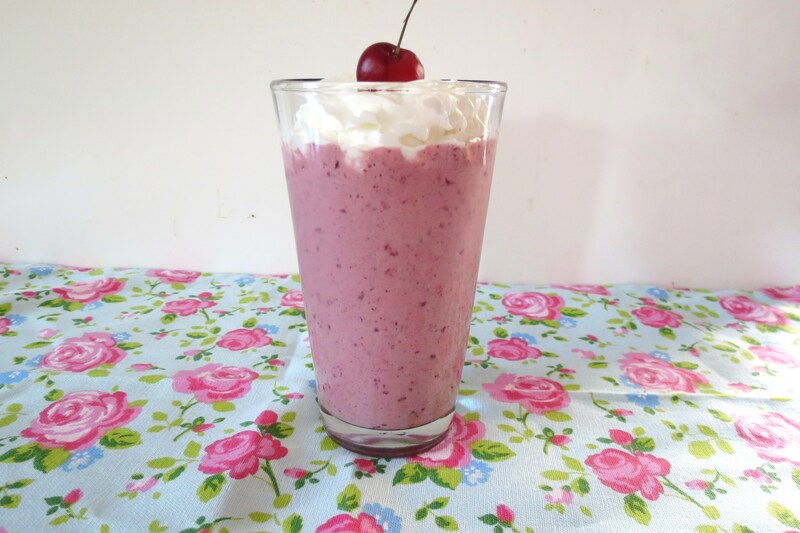 This is a creamy, sweet wonderfully delicious cherry smoothie. I can’t believe I didn’t create this before. I think it’s always because I have strawberries on the brain that I tend to forget the other fruit. 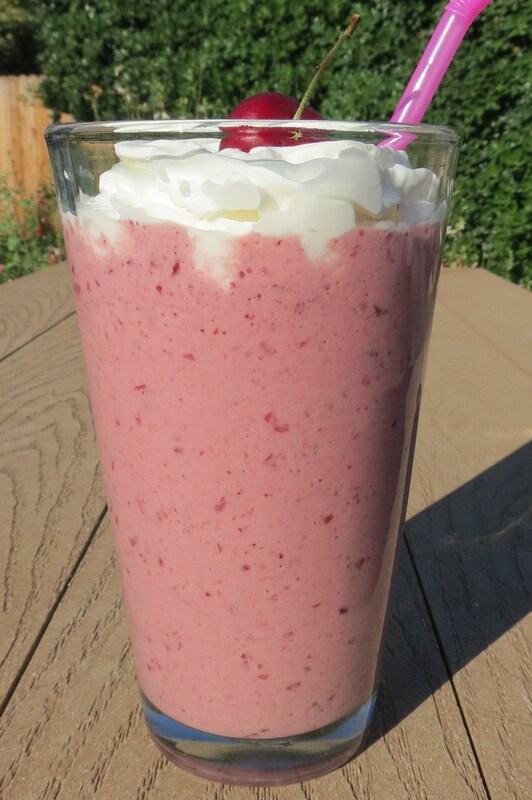 This is perfect because cherry season is right around the corner and this would be out of this world with fresh cherries! I used frozen ones in this drink, but hoping the next one will be with fresh. By the way I bought my frozen cherries from Target. They have a wide assortment of frozen fruit. I sound like an advertisement don’t I? Last year my Husband and I went cherry picking. That was so much fun. I ate so many cherries it’s unbelievable. Nothing like picking and eating. No I’m not talking about your nose either. Get your mind out of the gutter, thats just gross. 🙂 Anyway, we picked so many cherries, I think it cost us like $30 or $40. Yah we went overboard. I bought one of those cherry pitters from Cost Plus and wow does that work like a charm. I highly recommend one. I believe it was from OXO. I pitted pounds of cherries and froze them, made jam with others and of course just ate them plain. I just love a sweet cherry. So what fruit do you look forward to when there in season? For me, I love all fruit, but my favorite are berries of course and then apples. But I also love peaches too! I want to think peach season should be coming up soon! Woohoo! I love this time of year!!! 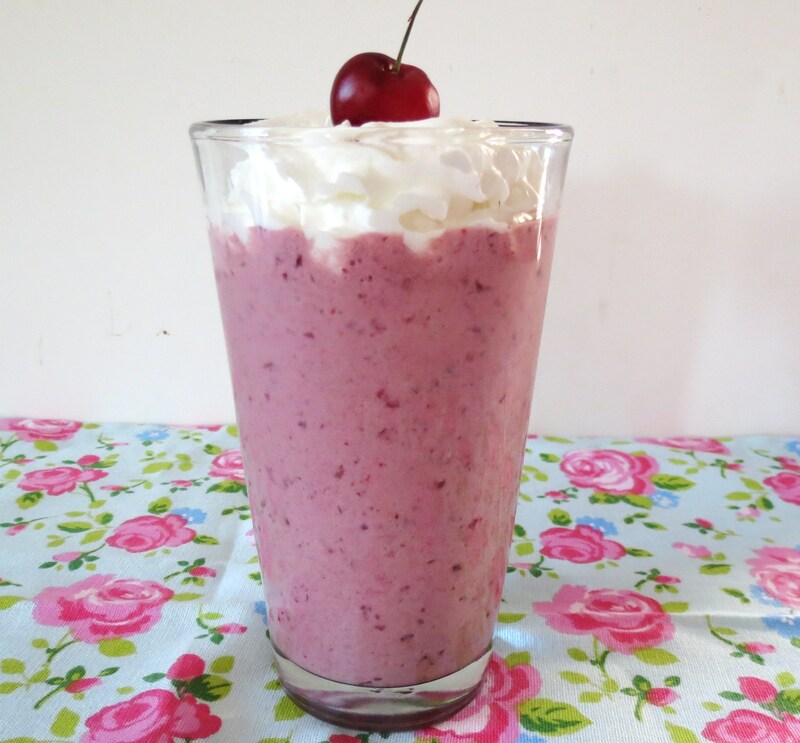 A healthy, sweet, creamy smoothie made with cherries, yogurt and milk. Perfect for an afternoon snack. Serve with reduced fat whip cream and a cherry! You know I have to compare my stats with Panera Breads Cherry Smoothie. I will tell you there’s tastes different from mine. From what I recall it had a slight orange taste to it and it was a lot sweeter. So it’s not a copycat recipe. This is just to get a general idea what is out there compared to what you can make at home. Wow, look at the carbs, sugar and protein difference! Crazy isn’t it? It’s terrible that restaurants claim healthy, when it’s really not! I love every kind of fruit but cherries are on the top of the list for me! 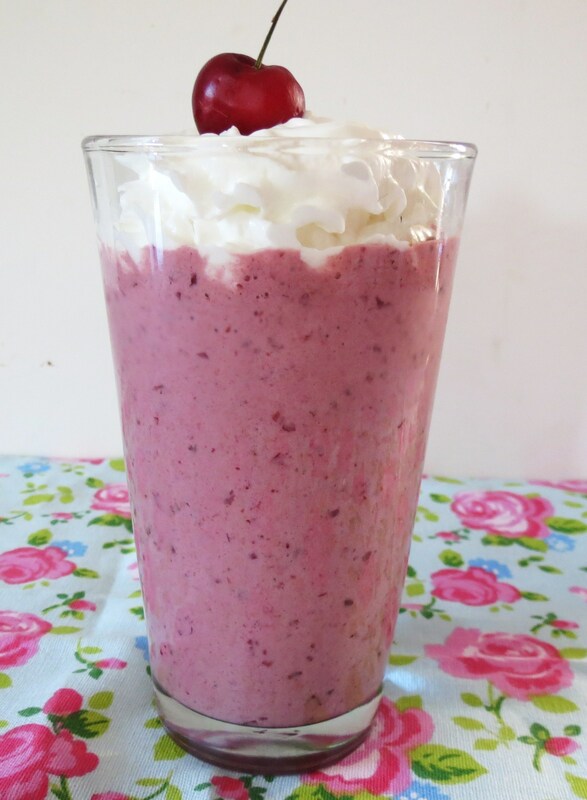 This is so pretty and with 16 grams of protein, it would keep me going all day! I love this time of the year with all the cherries.I’m hoping to go cherry picking this weekend.I need to stock up, since the season is short. 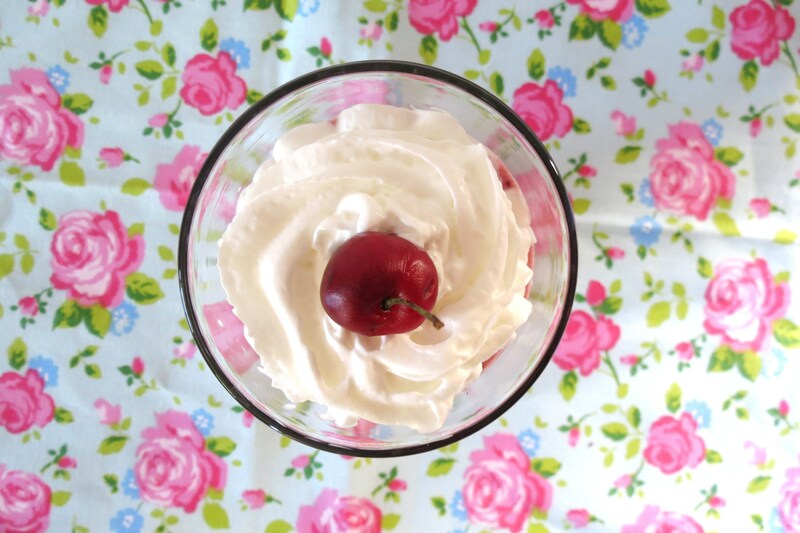 cherries are one of my favorite summer fruits! I can’t wait for them to come into season so I can wake up to this! There in season now.We have cherry picking that started last weekend! So be sure to get yours! I am obsessed with cherries and hardly ever use them in smoothies. Looks delicious! This was my first time putting them in a smoothie. I love it!! I’d say the same,but it’s a little chilly here to get in the pool. 🙂 Hopefully we can open the pool by Memorial Day! Ohhhhh yum! This looks amazing! I’m sipping a diet coke right now! I need this instead! Diet Coke! You need a smoothie instead! It will be more satisfying!! I’m pretty lucky where I live. The orchards are about 5 miles from my house!! Thats one thing thats good about living in the middle of no where. This looks like dessert! Delicious, creamy, I-want-one DESSERT! I also have a cherry pitter and it is the most useful kitchen gadget! Works great with olives, too! Thanks for sharing and your photos are YUM! I never thought of using a cherry pitter for olives, great idea!! My Husband thought it was a waste to by a pitter, until we ended up buying a few pounds last year! Great tool!! 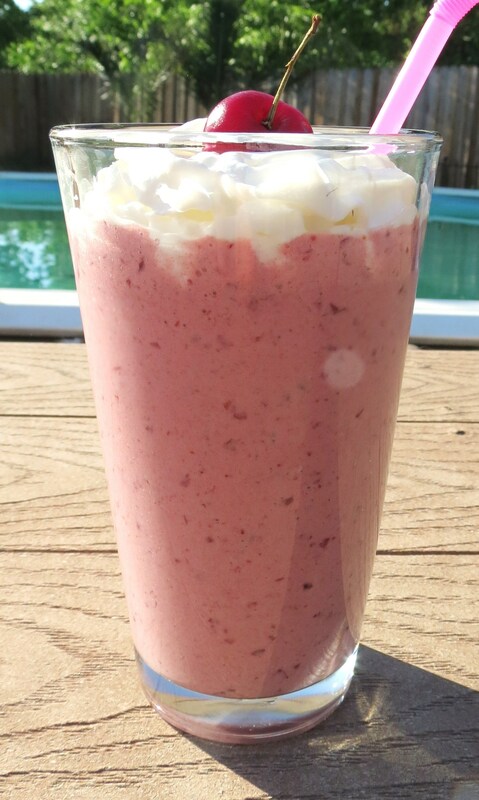 Wow, this smoothie looks so good. I’ve had cherries in my freezer for about a month waiting to be used in a smoothie. I’m so going to make one soon. Thanks for reminding me. Yum! I want this NOW!!! 🙂 Thank you for sharing and linking up on successful saturdays!!! I LOVE cherries and would put them in absolutely everything. I have got to get a cherry pitter, though. This looks phenomenal. And yes … you wonder what they put in the smoothie to add so much sugar. Making at home is so much more healthy! i love this idea! i had no idea panera had a cherry smoothie. sounds delish! I didn’t know either, and oddly enough I never thought of a cherry smoothie until I had there’s.